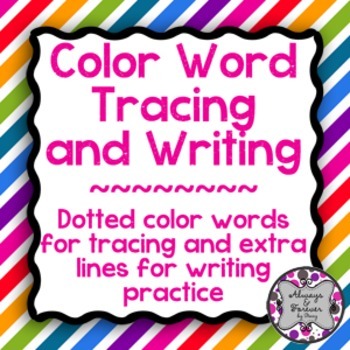 This download is a PDF containing 10 color words for tracing and writing practice with a picture next to it. You can laminate this and use over and over again with dry erase crayons or markers! Check out the preview of this file to see what you are getting! I hope you enjoy this product! Please make sure to check out my store at www.teacherspayteachers.com/store/alwaysandforever for additional products and freebies!